Cool off with this summer with a bowl of Easy Berry Sorbet. With just a few simple ingredients you’ll be enjoying a cool and refreshing glass of berry sorbet. 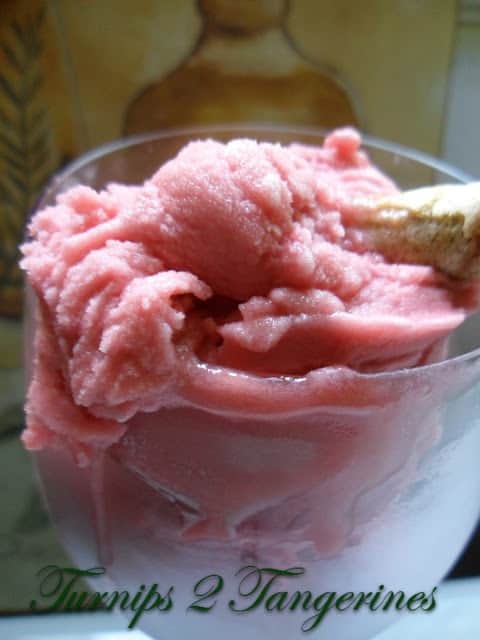 Sorbet [sor-BAY] is French for “sherbet,” which Italians call sorbetto. 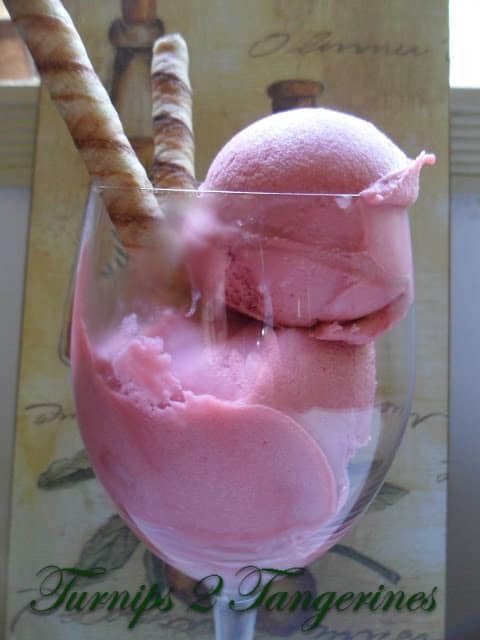 Sorbet is sometimes distinguished from sherbet by the fact that it never contains milk. It’s also often a softer consistency than sherbet. 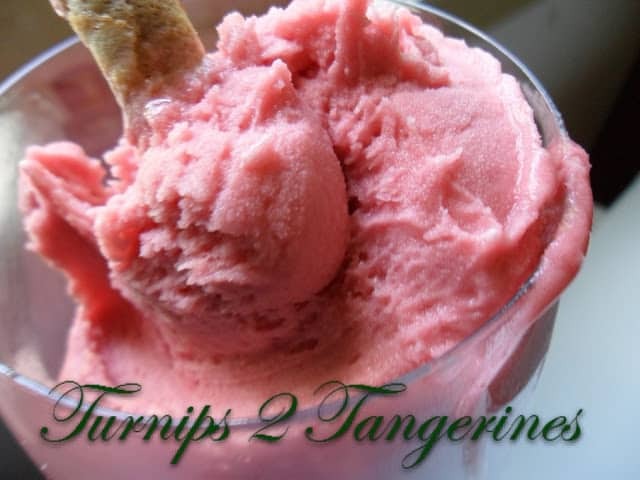 Savory or lightly sweetened sorbets are often served either as a palate refresher between courses or as a dessert. Sorbets are sometimes called ices or granitas, though both of these mixtures are generally more granular or slushy in texture than a sorbet. This recipe calls for a small amount of berry flavored vodka. This is totally optional. The reason for adding vodka is really a simple one. Since vodka or alcohol doesn’t ‘freeze,’ I like to add a small amount to sorbets. This will give the sorbet a slushy consistency. You might be thinking then, the sorbet in the photos above doesn’t look ‘slushy’ and you’d be right. 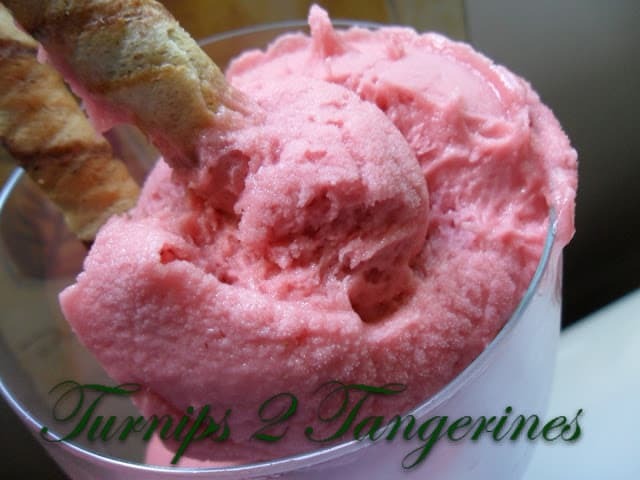 Before serving this delightful concoction to my ‘picky’ hubby, I whipped a small amount of raspberry sherbet into the easy berry sorbet. My ‘picky’ hubby give it his stamp of approval. Alleluia! In a large bowl, combine the frozen berries, yogurt, water and frozen juice concentrate. Place half of the mixture in food processor bowl. Cover and process until almost smooth. Repeat with remaining mixture. Stir in berry vodka if using. Transfer mixture to a shallow baking dish. Cover; freeze about 4 hours or until firm. * Using a metal baking dish will make the sorbet freeze faster. The recipe was made with Van Gogh Vodka. Hi Kristin~ Thanks for stopping by and the follow~ Love Fireworks Over Ferris Wheel! Btw, thanks for hopping by my blog. I'm following back. Sounds delicious, with no added sugar! Hi Betty~ Yes, no sugar~ Something I want to change in my diet also:) Congrats! on your weight loss!! Love that no ice cream maker is needed! Pretty color too!